1957 Panhead FLH refinish project Midnight Blue. This is where we start, a very poor rear fender, the best of whats left. Siren hole, cracked, split, torn, a real mess. There are also tears around the battery strap hold downs. We have remover the rear fender section, and the braces, the owner managed to find a N.O.S. fender flap. Lucky man. This is the roughed in replacement siren patch. These fender sides required some shrinking because a panhead fender has a slight roll on each side. There were numerous cracks and tears at the toolbox mount area, and the fender brace areas needing welding and repair. I put a car fender washer behind the toolbox hole to strengthen the area. We had to remove the inner reinforcement where the U-clamps hold the fender to the frame, straighten the inner brace, and the outside of the fender, Blast it, weld through primer, and re-attach it, we also removed the reinforcement for the fender brace by carefully drilling the spot welds, straightened it and the fender, and re-installed it. There also were Eight saddlebag holes on each side of the fender. The repair section welded in, and also another stress crack welded at the chain guard relief. After all the welding is complete, a final sand blast before applying filler. The whole fender will receive a skim-coat of filler. 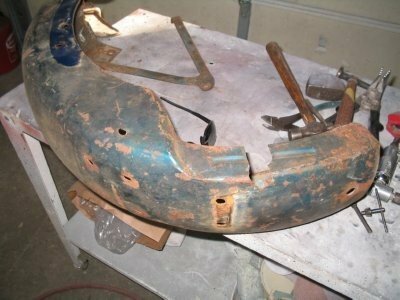 The fender braces even had holes that needed welding and straightening. Filler work completed, Right side. Filler work completed, Left side. Left Gas tank filler work finished. Under the primer, soapy water bubbled in this corner, after blasting, we found this repair to leak. We had to remove the brass so we could weld the corner up, but there were more holes. This is what we found when we removed the brass. Welding can not be performed over Brass. it ALL needs to be removed. These holes were under a fiberglass patch where the tank emblem goes, also visible is one of several dents in the tank. Two more holes accompanied by a stress crack at the seat T mounting area. Welded and a new emblem mount fabricated. Rear of tank welded, this was the worst hole, inside the tank is obviously thin. We would weld it, grind it, test it, several times, the blast it and touch it up again. The stress crack just kept traveling on this one, each repair was done four or more times before the tank would hold four pounds of pressure. Gas tanks are not pressurized in use, they are vented, feeding fuel by gravity. to hold four pounds of pressure is more than adequate. This is the Left tank pressurized, and being tested with soapy water. it was fine. every joint and every seam passed the test. Left side in good shape. I lightly blasted the insides of both tanks because they were rusty. This is a late model, probably 1972 front fender. We removed a bracket on the left fender mount, relocated the brake tube mount drilling and taping the hole, and welding the old hole. We also welded four holes in the rear of the fender for a late style moulding, and we fit the stainless trim and drilled for it. The front fender is off a Disc Brake front end. It had been hit in the nose, hit in the rear, and someone had put a lot of filler on it without fixing the dents. We fit a 1958 and later moulding to the nose to get the proper shape, and fit a stainless trim to the rear, and properly pushed out the dents. It will receive a skim coat. All the parts ready for Sealer The insides were previously painted, now they are masked to avoid overspray. Color coat finished, This Optional color for 1957 is Midnight Blue, the owner did not want the white panel on the tanks. More of the finished product We also wet sand and buff the tops of the panels, this removes any dust (and there is ALWAYS dust). This is how the rivets should appear.